Check on these top 10 things that you should never do when you are taking your furry pal to your vet. Just going to your vet office without any prior announcement is never a great idea. Calling your vet’s office before heading or just informing that you’re on the way headed towards office with an emergency creates lot of turbulences. Dropping in without an appointment, you may be turned away if your pet’s condition is not serious, forced to leave your pet or wait until next available slot. Waiting rooms are filled with lots of noise, chaos and delays. It is never the fault of receptionist or staff problem. Try to understand their position, as they are always there for your help caring for your pet. Show respect and be polite, this helps to ease the situation. Veterinarians are people who look after your pet and are working to make your pet healthy again through their experience and knowledge. Making them feel low should be strictly “NO NO”. Behave in a good manner when concerning about your furry friend with your vet. In all ways, he is going to help your dog or cat regain health. Waiting rooms are full of pets and pet parents. So make sure that your pet is on leash. This makes your pet to be under control and safe. Long nylon leashes are best rather than those retractable ones that are little tricky to handle. Taking numerous pet health issues like irritated skin, ear infection, and painful tooth at one go and that too without any appointment will not work well. Don’t wait for the various health issues. Visit a vet when your pet is suffering from anything, even for a minor problem like tooth ache. If your pet has a health problem, and you need to visit a vet, then don’t wait for the last moment and then rush to a vet. The staff is also human like you and wants to leave for home for their families. When the problem is not too severe or you can wait for the next day, better avoid running at the last moment. Talking on your iPhone when your vet is advising you something important depicts how uncivilized you are. When your doctor is discussing something serious about your furry pal or advising you related to your pet, ignore those phone calls. Crowding vet’s office with all your pet family is a great devastation. It can be tempting to get vet help to all your furry friends at one go only, but this can only create confusion. So, better one or two pet at a time to understand their treatment properly. Missing to disclose about medication or treatment to your vet, which you have given recently to your lovable pal would lead to serious issues. Your vet has to know exactly what you have given prior to bringing in order to provide proper medication. Dropping in vet’s office with all your family members including kith and kin sounds ridiculous. 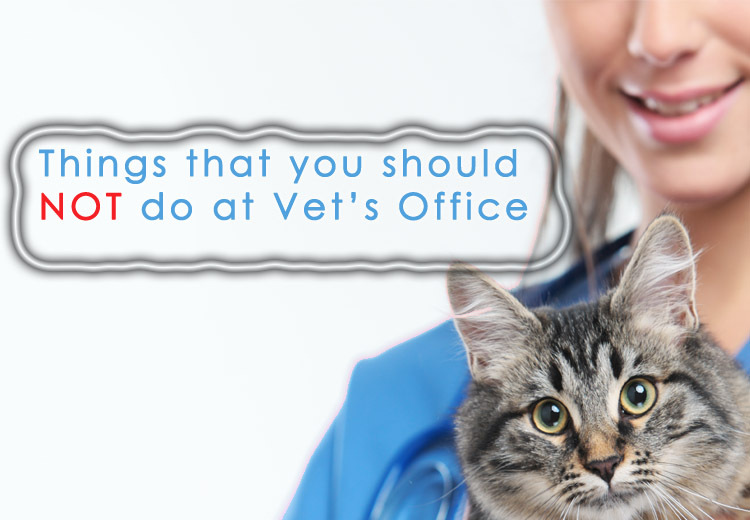 It will not only irritate but also disturb your vet while checking your furry pal. You can get all members only when it is necessary to bring them up may be during vaccination or a situation when everybody wants to be present (e.g., euthanasia). Consider all the above points for being a responsible pet parent and the one who goes cool with vet and his staff. Did you ever act crazily at vet’s office? What you felt about the situation? Do share with us.